Many of the allowable foods may be new to you, so it’s best to give yourself some time to prepare in advance. In preparing for Phase 1 of the Lyme Inflammation Diet®, we suggest picking your recipes for the week and start stocking your pantry and refrigerator with the necessary ingredients a few days prior to starting the diet. 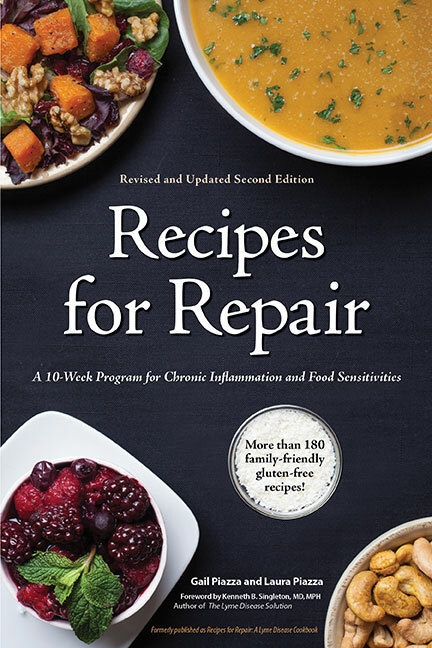 Refer to the How to Save section (pages 46-47) and the Resources section (pages 274-275) in our book, Recipes for Repair for suggestions on where to buy some of the harder to find ingredients and how to find discounts on the more expensive items. Determine which sauces and condiments your recipes require, review the Pantry and Sauces and Condiments section (pages 234-273), and if possible make what you’ll need in advance. Prior to starting the diet, it’s a good idea to rid your pantry and refrigerator of unhealthy foods so you don’t feel tempted by them as you start Phase 1. On pages 35-37 we list the foods and drinks that Dr. Singleton doesn’t allow in the diet. Remember to buy and eat organic foods if possible, because non-organic foods contain herbicides, pesticides and other substances that add to the burden of liver detoxification. Organic foods, by contrast, help to reduce the toxin burden placed on your liver. If you’re new to cooking, you may find pages 50-55 helpful; they provide kitchen equipment definitions and explain cooking methods terminology. For the recipes you really enjoy that can be frozen, make a double batch the next time and save the remainder for another day. Reducing effort like this will help encourage your healthy recovery. Don’t forget to print out the Phase 1 and 2 Shopping Lists to help make your trip to the grocery store more efficient.